XTI Aircraft is in live offering mode and is actively accepting Title IV investments. The future is now. Lift Up. Jet Out. Welcome to XTI Aircraft Company. Our revolutionary TriFan 600 Hybrid Electric Vertical Take-Off and Landing aircraft Changes Everything! It's a big opportunity to revolutionize air travel and is designed to deliver even bigger returns. There’s a significant unmet need in the aircraft market —and we have the only viable way to fill it. Those who invest now will own a piece of XTI and benefit as we grow and achieve our milestones. We invite you to learn more and join us on this journey. Successful businesses solve problems. They make customers’ lives easier. And that’s exactly what the TriFan 600 is all about. We are filling a market need - door-to-door air travel over long distances - in ways no other aircraft possibly can. No commercial aircraft of any kind can fly directly from point A to point B with the range, speed, or comfort of the TriFan 600 vertical takeoff airplane. No helicopter can match the performance of the TriFan 600 and no business jet can land in your backyard! This is a new type of aircraft, with an entirely new combination of capabilities that are unique in the market. Our initial target market for the TriFan 600 is business aviation, city to city commuter customers and private individuals. Business Jet Traveler magazine says that people fly privately to (1) save time, and (2) gain access to destinations not served by airlines. The TriFan 600 accomplishes both objectives. The TriFan 600 will save each person hundreds of hours a year by not having to travel to and from airports by ground transportation. For business people, every wasted hour due to travel time has an inherent opportunity cost, and that’s why aircraft owners will pay millions more for time and convenience. But as shown in the figure below, the speed of an aircraft does not always equal more time saved, and the TriFan completely trumps conventional business jets and helicopters in this regard. Prior to its launch, XTI commissioned detailed market studies that reported a strong potential market and ongoing demand for the TriFan 600. These studies, conducted by prominent aviation market research firms, give us reason to be bullish on the future. Globally there are over 60,000 business airplanes and helicopters in operation. Based on market trends and projected demand for fast, runway-free transportation, experts say XTI can expect to annually sell a minimum of 40 and up to 100 TriFan 600s, each priced at $6-8million. In addition to the crowdfunding and other fundraising efforts currently underway, XTI intiatied a pre-sales program in 2017. Already we have nearly 60 orders! Buyers are able to make a refundable deposit, reserve their place in line, and retain that priority position as the company reaches commercial production of the TriFan 600. With as few as 100 orders, the gross revenues of XTI represented by those orders would be over $600m. In early 2018, now that we have quantified market deman through the pre-sales program, begun construction of the flying prototype, and received our second patent, the company will leverage those facts to increase its valuation for the next round of financing. All members of XTI's management are shareholders in the company and highly motivated and incentivized to increase the company's value and create a path to liquidity and a market for all shareholders, including those who invest through Regulation A+ crowdfunding financing. In addition to making shares tradeable in the secondary market, XTI will continually assess and explore other ways to achieve liquidity for all shareholders, including strategic relationships with publicly traded aircraft companies, and examining whether an initial public offering should be part of the company's financing strategy within the next few years. These are all realistic and viable options. The XTI business plan includes a realistic path to profitability and strong returns for investors when targets are met. Current priorities are (1) financing initiatives, (2) flying the prototype in 2018, and (3) continuing discussions with potential vendors, partners, and suppliers for the full test program and production aircraft. The TriFan 600 is a six-seat, vertical takeoff and landing airplane. It is not based on new technology, but it takes existing technology and applies it in a revolutionary configuration. This reduces risks associated with manufacturing and obtaining FAA certification. Features include ample cabin space, easily configured with multiple options. Using three ducted fans, the TriFan 600 lifts off vertically. In seconds, the two wing fans rotate forward for a seamless transition to high-speed flight. And within just 90 seconds, the aircraft reaches cruising speed – where, like every other fixed-wing airplane, the wings provide lift. The fuselage-mounted fan, no longer needed, closes up. The airplane flies directly to its destination and reverses the process, landing vertically right where it needs to be – over a clear helipad sized paved surface, a golf course, backyard, job site, or thousands of other locations around the world where it’s safe and legal to land and takeoff. THESE MATERIALS MAY CONTAIN FORWARD-LOOKING STATEMENTS AND INFORMATION RELATING TO, AMONG OTHER THINGS, THE COMPANY, ITS BUSINESS PLAN AND STRATEGY AND ITS INDUSTRY. THESE FORWARD-LOOKING STATEMENTS ARE BASED ON THE BELIEFS OF, ASSUMPTIONS MADE BY, AND INFORMATION CURRENTLY AVAILABLE TO THE COMPANY’S MANAGEMENT. WHEN USED IN THE OFFERING MATERIALS, THE WORDS “ESTIMATE,” “PROJECT,” “BELIEVE,” “ANTICIPATE,”“INTEND,” “EXPECT” AND SIMILAR EXPRESSIONS ARE INTENDED TO IDENTIFY FORWARD-LOOKING STATEMENTS, WHICH CONSTITUTE FORWARD LOOKING STATEMENTS. THESE STATEMENTS REFLECT MANAGEMENT’S CURRENT VIEWS WITH RESPECT TO FUTURE EVENTS AND ARE SUBJECT TO RISKS AND UNCERTAINTIES THAT COULD CAUSE THE COMPANY’S ACTUAL RESULTS TO DIFFER MATERIALLY FROM THOSE CONTAINED IN THE FORWARD-LOOKING STATEMENTS. INVESTORS ARE CAUTIONED NOT TO PLACE UNDUE RELIANCE ON THESE FORWARD-LOOKING STATEMENTS, WHICH SPEAK ONLY AS OF THE DATE ON WHICH THEY ARE MADE. THE COMPANY DOES NOT UNDERTAKE ANY OBLIGATION TO REVISE OR UPDATE THESE FORWARD-LOOKING STATEMENTS TO REFLECT EVENTS OR CIRCUMSTANCES AFTER SUCH DATE OR TO REFLECT THE OCCURRENCE OF UNANTICIPATED EVENTS. XTI Aircraft Co. has switched to hybrid-electric propulsion for its planned TriFan 600 ducted-fan vertical-takeoff-and-landing (VTOL) business aircraft. Dear XTI Supporters, We are expecting the new electric motors to arrive next week and are targeting first flight soon after. Meanwhile we wanted to share a recent photo with all the components (except motors) installed. The TriFan 600 will have a 1,000-shpturboshaft engine driving three generators that power dual 250-kW motors oneach of two 6-ft.-dia. wing-mounted ducted, pivoting fans and acounter-rotating, 5-ft.-dia. fan mounted in the aft fuselage. The two largerfans are mounted on the wing leading edges and tilt between vertical andforward flight. The smaller lift-only fan, which helps counter adverse yaw viaa set of vanes, is shut down and covered over with doors in forward flight. 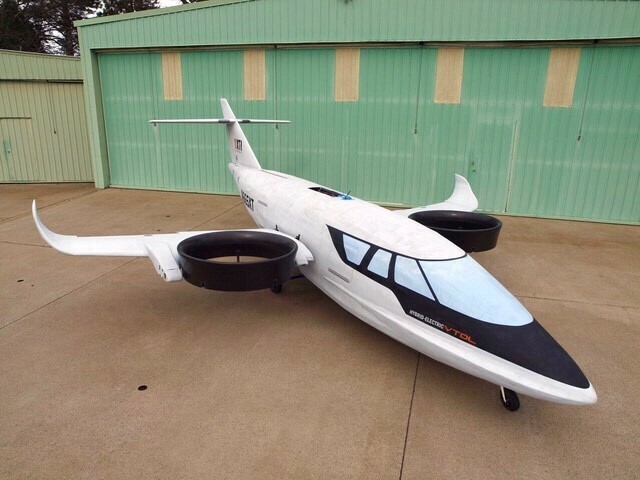 The Colorado-based startup expects toconduct a critical design review and assembly of the full-scale test aircraftover the next year, with a further two test airframes joining the program inthe following year. The company is targeting certification and initialproduction starting around 2023. XTI has taken reservations for 76 aircraft andenvisages a market for around 2,000 TriFans for a variety of missions rangingfrom business and commuter roles to emergency medical services and possiblymilitary utility. Dear Investors and Followers, I wish you a happy and healthy 2019 from all of us at XTI Aircraft. Thank you for your interest and investment in our ground-breaking project. Although we did not get in the air as planned in 2018, that milestone is imminent. The prototype aircraft was built quickly and safely, now we are proceeding through electrical check-outs of the power system slowly and carefully so that the aircraft, the components and people are preserved. The team has learned a lot in the process, and the delay encountered will pay dividends as we proceed further into testing the prototype and building and flying the full-scale aircraft. You will be the first to know when we achieve first flight of the prototype. Thank you again for your support. 2019 will be a big year for XTI. Happy New Year! This is a good read with some good images and comments from XTI. Enjoy! ORLANDO, FLORIDA, USA, October 17, 2018 /EINPresswire.com/ -- Icon Aviation (Icon) and XTI Aircraft Company (XTI) jointly announced today that Icon has placed an order for one TriFan 600 vertical takeoff airplane. The XTI TriFan 600 is the world’s first commercial hybrid-electric VTOL airplane. With this order, XTI continues to build its global reservations backlog, now representing $416 million in gross revenues upon delivery. As momentum grows in the aircraft industry’s search for alternative power and propulsion systems two of the leading engine-makers, Honeywell and Safran have become the first to independently display large-scale test hardware for practical hybrid-electric and electric-powered aircraft. While the rise of electric vertical-takeoff-and-landing (eVTOL) urban air mobility vehicles provides the spark for much of the initial development, power generation manufacturers are already starting to build on this foundation as they sketch out longer-term road maps to meet higher electrical power needs for military applications, as well as for general aviation and regional transport aircraft. As makers of conventional gas turbines dip their toes into the formative electric propulsion market, they are also joining forces with providers of electrical systems, motors and batteries, either by creating new links internally within their corporations or by finding outside partners. “All of us at Honeywell believe this market is a matter of when, not if,” says the company’s senior director for hybrid-electric/electric propulsion, Bryan Wood. “We are looking at three main sectors; military, small fixed-wing and VTOL.” Covering potentially all three sectors, the company continues development work on a 1-megawatt power generator, now redirected at potential commercial applications following cancellation earlier this year of the Aurora Flight Sciences XV-24A hybrid-electric VTOL DARPA X-plane for which it was originally intended. Part of the study involves deciding which new technology areas to develop and invest in, and potentially what areas to partner on. “We have gas turbine options such as the HTS900 and the 131-9 [auxiliary power unit],” says Sill. “That is a nice size class and we have some generator options, but the perimeter is broader than that, so we have to look at our options. “We believe we are further along than anyone else in the industry in regard to that product,” says Wood. The company is “very, very close to running the 1-megawatt generator at full power,” he adds. “We are at least 90% of the way there.” The runup to full power follows a redesign of the generator to improve heat management, a key challenge for high-density configurations like the Honeywell system, which is targeted at a conversion efficiency level of 98%. The 200-kW generators, originally tested on an LTS101 turbine as part of a U.S. Army program in the mid-2000s, are more mature, and form the basis for a range of nearer-term potential applications in the eVTOL and other lighter-lift sectors. Although most of these projects remain under wraps for now, Honeywell has acknowledged a tie-up with Denver-based startup XTI Aircraft, which is planning to develop its TriFan 600 ducted-fan VTOL business aircraft around an HTS900-based hybrid-electric propulsion system. Safran, meanwhile, used NBAA to showcase its first electric motor for hybrid and electric concepts just two weeks after being selected to power startup Zunum Aero’s hybrid-electric small regional aircraft. The ENGINeUS 45 motor has a continuous power rating of 45 kW, and is the first of a planned family of electric motors with power outputs up to 500 kW. Safran says the initial motor has built-in, dedicated control electronics with an energy efficiency of over 94% and a power-to-weight ratio of 2.5 kW/kg at 2,500 rpm. The motor at NBAA has been tested on Safran’s electrical integration benches to verify its performance. Safran has also tested four of these electric motors on the ground on a full distributed propulsion hybrid-electric system. Although the development has not been officially linked to any specific hybrid project, the technology is aimed at the many VTOL and other future regional and urban air mobility projects. These potentially include projects such as Bell’s flight demonstration vehicle, on which the company announced a tie-up with Safran in June. Safran Helicopter Engines announced in February that it planned to demonstrate a hybrid distributed power system on a vertical-lift platform by 2020. While the urban air mobility market is driving development of all-electric vehicles, Safran is among several engine-makers who say aircraft that need longer endurance or range will need a hybrid system. Developed to produce relatively high power densities at low speed, the initial ENGINeUS 45 motor has a continuous torque capability of 172 newton meters (nM) (127-ft.-lb. ), and a torque density of 10 nM/kg at 2,500 rpm, based on the total weight of the motor. Under the long-term agreement with Boeing-backed Zunum, Safran Helicopter Engines is developing and certifying a version of its 1,700-2,000-shp Ardiden 3 turboshaft to generate electrical power on the 12-seat, 700-mi.-range ZA10. The modified Ardiden 3Z will form the basis of a 500-kW turbo-generator that will supplement the aircraft’s battery packs and together power the aircraft’s two 500-kW electric ducted fans. Safran will couple the modified Ardiden to an as-yet unspecified electric generator selected by Zunum, and will ground-test the 500-kW turbo-generator in France by the middle of 2019. The system will then be delivered back to Zunum for installation in its modified Rockwell Turbo Commander flying testbed. XTI expects to finish its 2/3 scale prototype next week. We will send pictures after we have it primed and looking good!